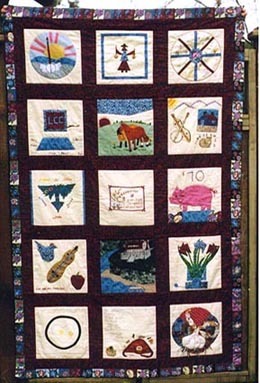 This FRIENDSHIP QUILT was given to me by a group of friends and relatives in March, 1998. The idea was the brain-child of Shelby Atwood and Kathy Blago. The squares were hand made by the individual contributors and the theme was simply anything the contributor remembered about me. Friendship quilts, in my extended family of friends, are generally a suprise. They are given for an event, like a newborn child, a new career job, or for no reason at all. As for this quilt, Shelby and Kathy just decided it was time for me to receive one. If you click on any square, an enlarged version of the square will appear with its history.